H undegger PBA m achin e s eries The PBA is a "gantry" style fully automated woodworking center designed to efficiently cut large panels and beams. The gantry can be built with several different tool options. Among other things, the following tool holder can be installed: a) 5-axis chain saw, b) vertical milling units, c) vertical drill units, d) tool changer with up to 11 individual tools, e) marking systems and so forth. With the PBA it is possible to process large parts such as wall elements, ceilings or ceiling members rationally accurate to the millimeter. The individual equipment of the machine according to customer requirements permits the processing of most diverse materials, e.g. solid wood, laminated girders, laminated timber, multi-layer panels and sandwich elements. The PBA has helped Structural Insulated Panel (SIPs) fabricators cut these panels faster and more accurate than could ever be done by hand. As SIPS continue to grow the PBA continues to become more popular. Due to the large traverse paths of the PBA, parts of any length, up to 8m wide and 48cm thick can be processed on 5 sides. 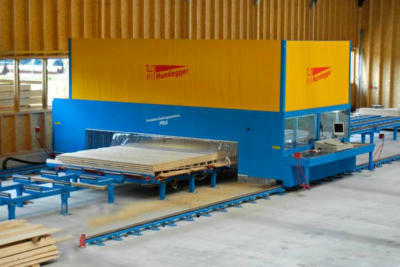 Fully equipped, the machine can process almost every thinkable part. Longitudinal, beveled and diagonal cuts can be sawed, openings of any shape and size can be milled and blind or through holes can be drilled - all processing s without tool change - whereby the parts can be produced very fast. The work area of the machine can be subdivided into sections so that the machine operator can load a part of the machine, while the gantry automatically processes a workpiece in another section. Clamping of the workpiece is not necessary due to the special supporting tables and the design. The 3D machine production software CAMBIUM controls the machine and acts as interface between designer programs, the PBA itself and the machine operator. CAMBIUM is characterized by simple input tailored to the needs of the timber construction industry and by its outstanding operating simplicity. 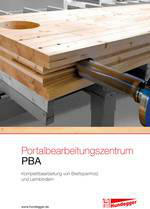 PBA Brochure Please check the attached PBA bro chure to find more information about the whole system. You are also very welcome to contact us for more detailed information on our products.